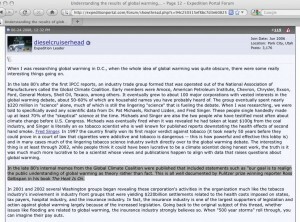 To quash the notion that no valid scientific criticism exists against the idea of man-caused global warming, enviro-activists often say “denier scientists” are paid by the fossil fuel industry to lie about the issue, insinuating a parallel to expert ‘shills’ who did the same for ‘big tobacco’. But the accusation has no punch without some kind of authoritative-sounding citation, so they inevitably invoke Ross Gelbspan’s narrative. Now, lets examine just how far and wide the successful spread of this accusation has been after Gelbspan’s first mention of it. Strange thing about that is he got the Balling / Michaels / Idso name combination correct (a problem I noted in my first blog piece here), but he could have clarified ‘broadcast appearances’ to mean just a couple on the radio, so it might be said we have a bit of an embellishment at the start (a problem I noted in my 2nd piece). Newspaper and radio advertisements were developed and a detailed PR campaign devised. Contrarian scientists Dr Robert Balling, Dr Pat Michaels and Dr Sherwood Idso would act as scientific advisors, make public appearances and write newspaper columns, the plan outlined. The second link in the above quote is somewhat predictable. 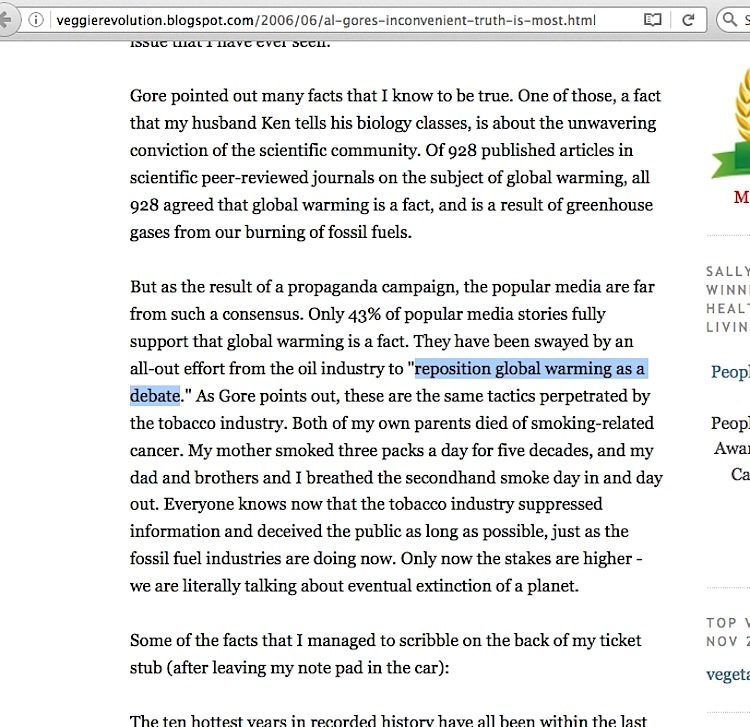 The famous Canadian activist/scientist David Suzuki links to Gelbspan in just the same way at his site (last link in the 4th paragraph, screencapture here), while others choose to link to people who cite Gelbspan. There is a significant development with Desmogblog’s piece yesterday with that first link about the “detailed PR campaign”, but I will detail it in my next blog piece here. So, you have the earliest and latest narratives with their direct ties to Gelbspan. The following examples – in no particular order – show how widely repeated it has been. The version in the photo below (click to enlarge) at a general discussion section for an offroad vehicle forum is what prompted me to look deeper the accusation. 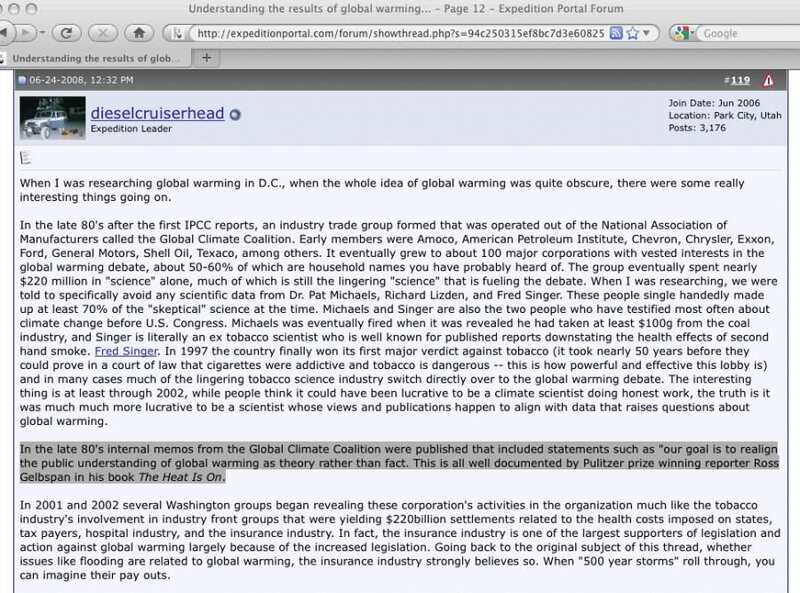 At first glance, it sounds very plausible and quite ominous, but I soon discovered its various errors about the incorrect wording of the actual memo phrase, the incorrect tie of it to the Global Climate Coalition, Gelbspan being incorrectly labeled as Pulitzer winner, the incorrect statement about Fred Singer being a ‘tobacco scientist’, etc. 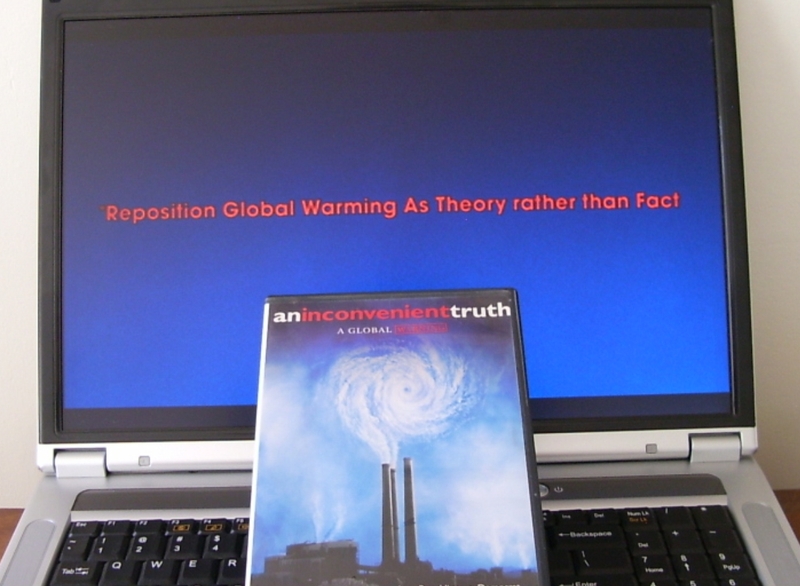 Then we have Gore’s 2006 “An Inconvenient Truth” movie. The DVD version of it on a laptop doesn’t look like much when you hit the pause button just before the 1 hour 13 minute point, but imagine this on a giant movie screen if you haven’t seen it. 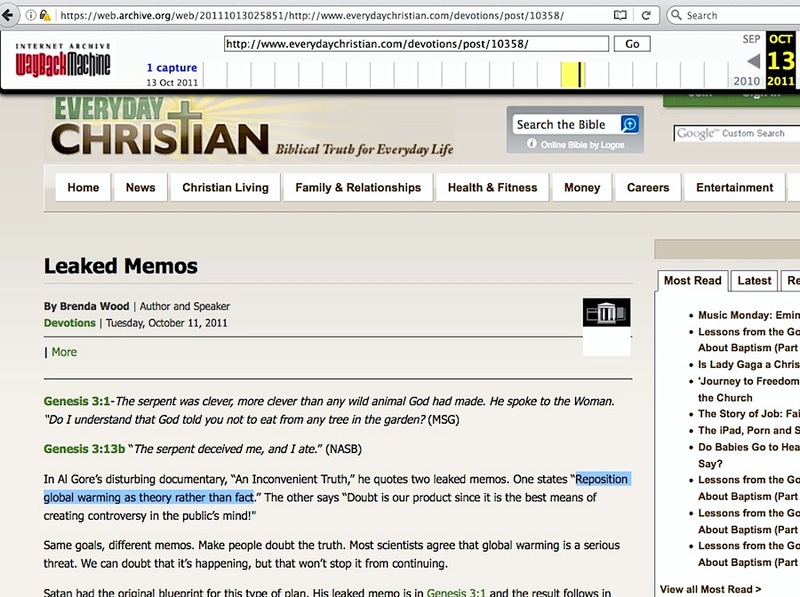 For those of you who have, you’ll likely remember how it was rolled out word-for-word across the screen. 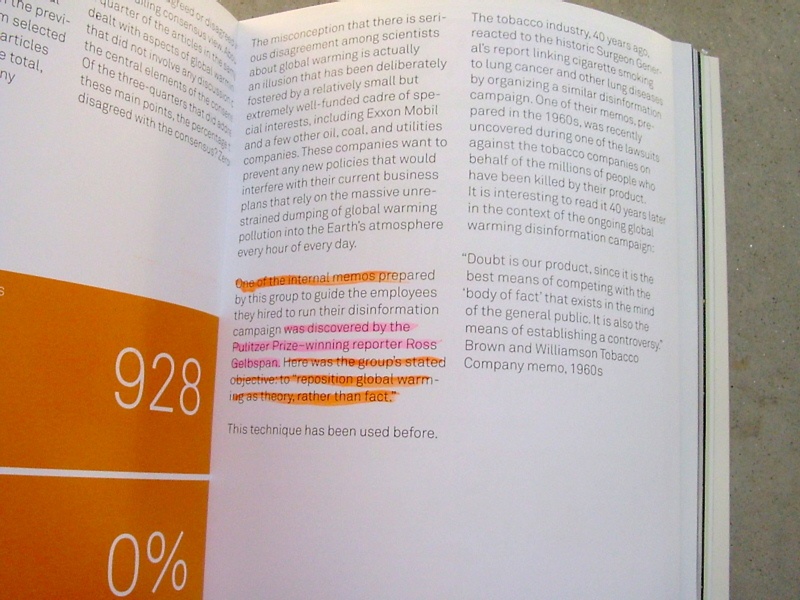 “We found an internal memo from an energy industry group from 1998, written by their disinformation specialists, saying their objective was: ‘Reposition global warming as theory rather than fact.’ That’s the same language that tobacco used. 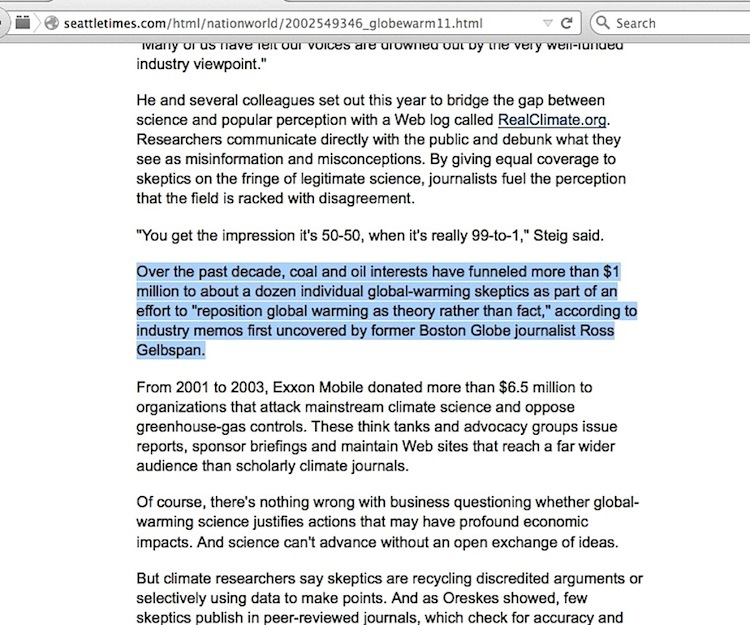 Only 43% of popular media stories fully support that global warming is a fact. 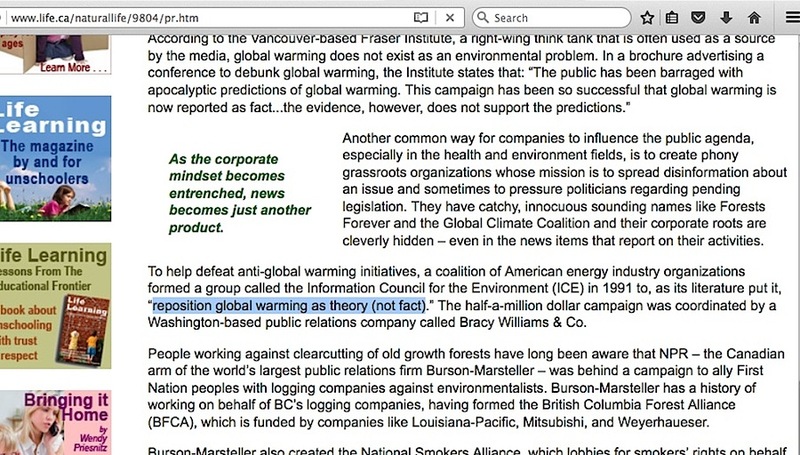 They have been swayed by an all-out effort from the oil industry to “reposition global warming as a debate.” As Gore points out, these are the same tactics perpetrated by the tobacco industry. 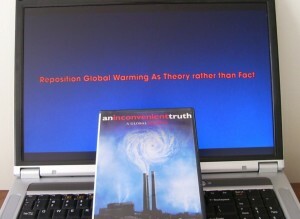 In Al Gore’s disturbing documentary, “An Inconvenient Truth,” he quotes two leaked memos. 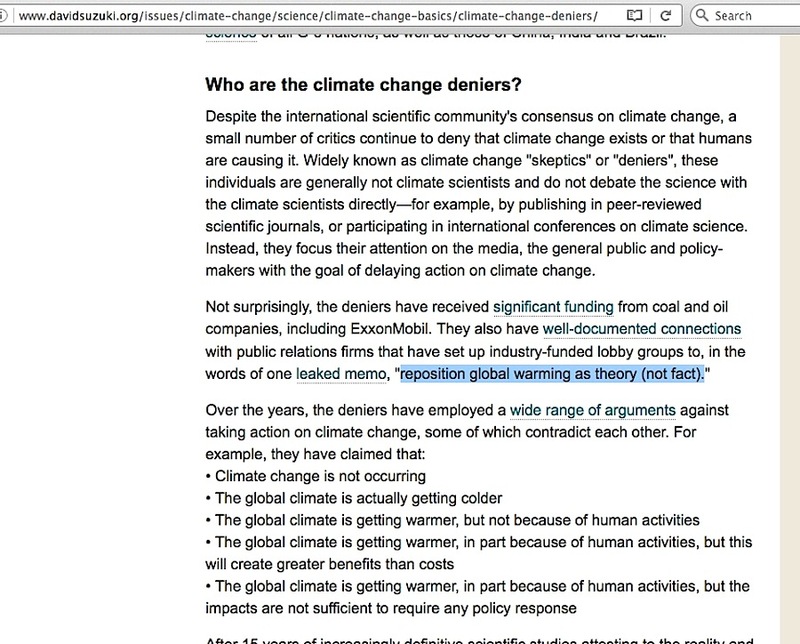 One states “Reposition global warming as theory rather than fact.” The other says “Doubt is our product since it is the best means of creating controversy in the public’s mind!” Same goals, different memos. Make people doubt the truth. I could go on with another several hundred repetitions of the accusation surrounding Gelbspan and Gore’s favorite ICE campaign phrase. But after a while, the point becomes abundantly clear. This is the only accusation there is, and it spirals back in each case to one source. Ross Gelbspan. Nobody else independently confirms or corroborates it, they just repeat it. Endlessly. And just like Gelbspan and Gore, not a shred of physical evidence is shown to prove money was given in exchange for demonstratively false fabricated science assessments. 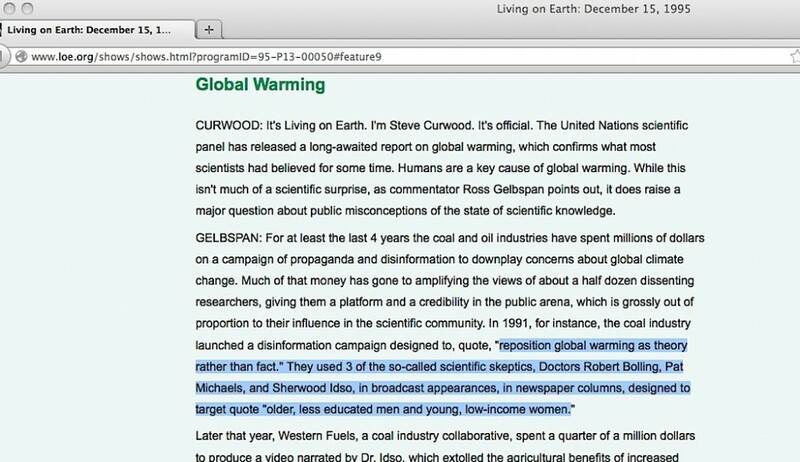 If multiple easily found problems with the ‘skeptic scientists receive corrupt fossil fuel industry funding’ narrative give a clear indication of how the whole accusation is in danger of total collapse, then we have a major problem with the long-held idea that there is no credible science-based opposition to the idea of man-caused global warming. 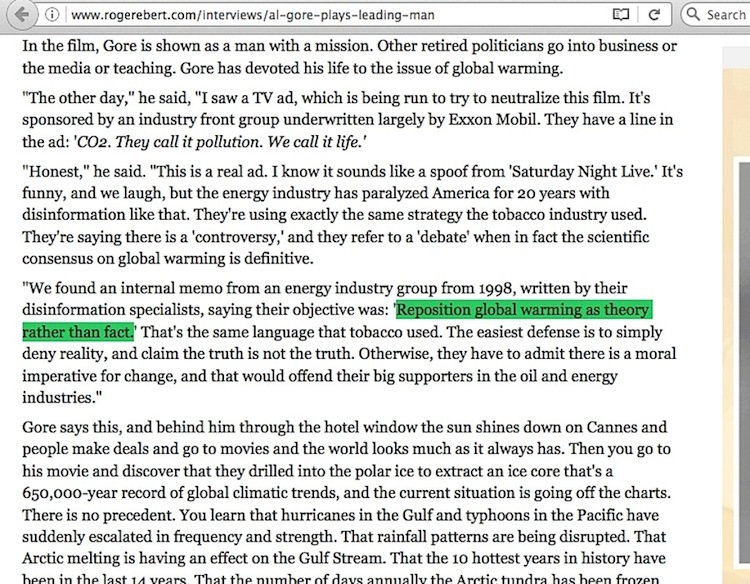 This entry was posted in accusation repetition and tagged Al Gore, ICE by Russell Cook. Bookmark the permalink.